A contemporary sterling silver bangle which has been handmade overlapping the wrist 3 times. 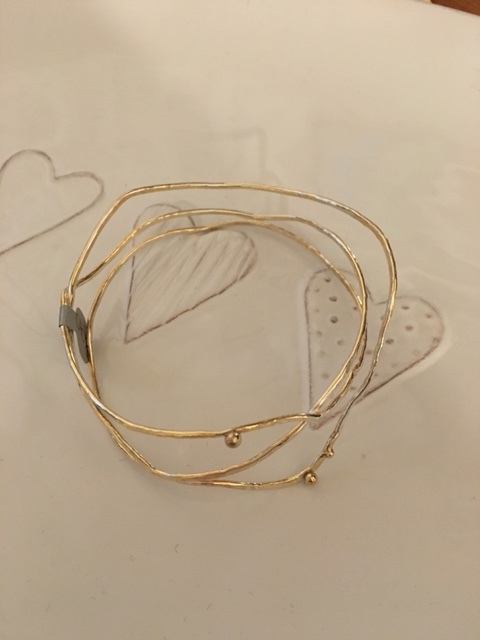 Attached are 3 small gold nuggets and the bangle is shaped to comfortable drape over the lower wrist. Hallmarked by the London Assay Office. Please note: it is impossible to come up with the identical design each time so every bangle will be slightly different! The diameter of the bangle pictured is 6.75cms.